This is one of my favorite and easiest fish dishes. The original recipe that I found in a Swedish newspaper called for fish bouillon, but it’s very hard to find fish bouillon here, so I tried Vogue Cuisine’s Vegebase instead. The dish turned out not only tastier, but it’s healthier without the MSG and transfats usually found in bouillon. It’s also gluten free. You can find Vogue Cuisine’s Instant Vegebase and Chicken Flavored Base at Market of Choice and whole food stores. Preheat oven to 350° degrees. Prepare the sauce first. Melt the butter in a large sauce pan. Mix in the flour. Stir in the water, wine, Vegebase and seasonings. As it thickens stir in Half & Half. Continue stirring as sauce thickens. When the sauce is thickened, pour enough of it into a 9 x 13 inch casserole dish to cover the bottom. Place the cod fillets in the dish. Cover with the remaining sauce. 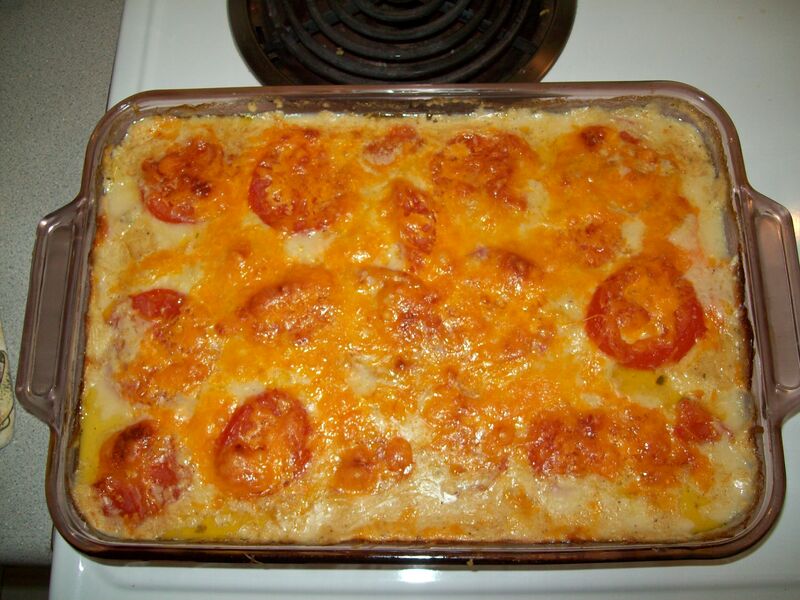 Cover with the sliced tomatoes and sprinkle the cheese on top. Bake 30 – 40 minutes. Serves 4 – 6. Serve with rice, salad, and your favorite bread. The sauce is meant to go over rice. The bread is great for sopping up remaining sauce. © 2010 Living In The Garden.